Today I’m SO excited to be at SNAP Conference in Salt Lake City surrounded by 500 of the most talented crafty bloggers learning, creating, and celebrating the friendships we’ve made because of blogging! To celebrate with you, I teamed up with Abbey from The Cards We Drew and a large group of bloggers to create Crafts in a SNAP- crafts made in 15 Minutes or less! 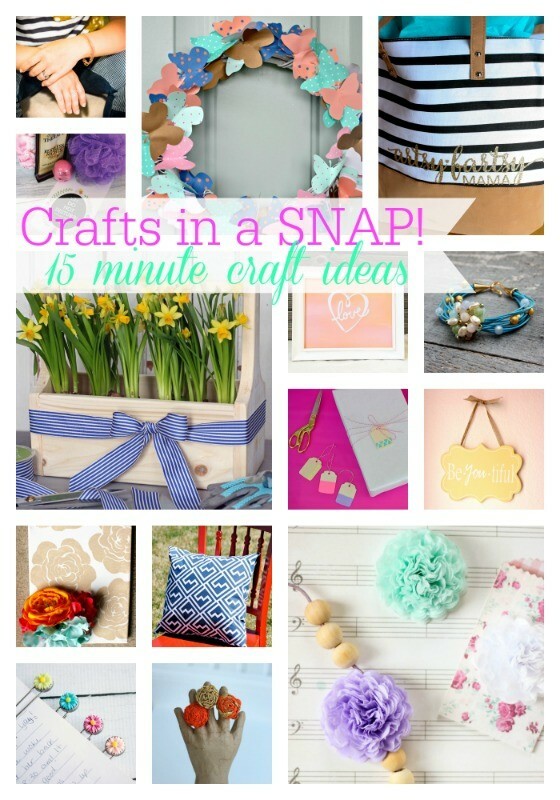 This way ANYONE, whether beginner or seasoned pro, can learn to create fun and handmade items in no time at all! Check out my tutorial for this quick DIY Wood Caddy coming up, then scroll down below and be sure to check out some of what my blogging friends have to offer!! Have fun and get creative! I’m no stranger to a craft quickie, like the 10 minute apron, or this easy hand painted sign, but I had never thought about building a wood craft in only a few minutes. I challenged myself to create a quick and easy . This easy to build wood caddy takes very little supplies (about $5 in materials), and has soooo many uses. Let’s get right into building one! ** note: This wood caddy took me less than 15 minutes to cut and assemble. Sanding and painting is additional time. First you will need to download and print and cut the pattern piece for the end. GET IT HERE. The pattern printable has the cut dimensions on it as well. Be sure to click ‘fill entire page’ when printing, the pattern should fill the width of the page. Cut lumber as indicated on the template. There two sizes of caddy, a narrow and wider one. 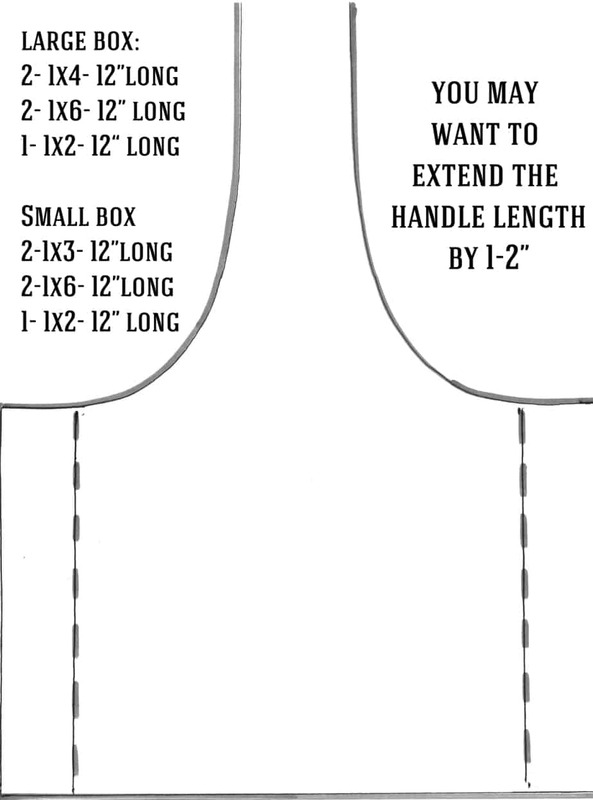 I made these boxes 13″ long, but the length can be determined by you. Trace pattern piece (twice) onto the 1×10. Using the jig saw cut out. 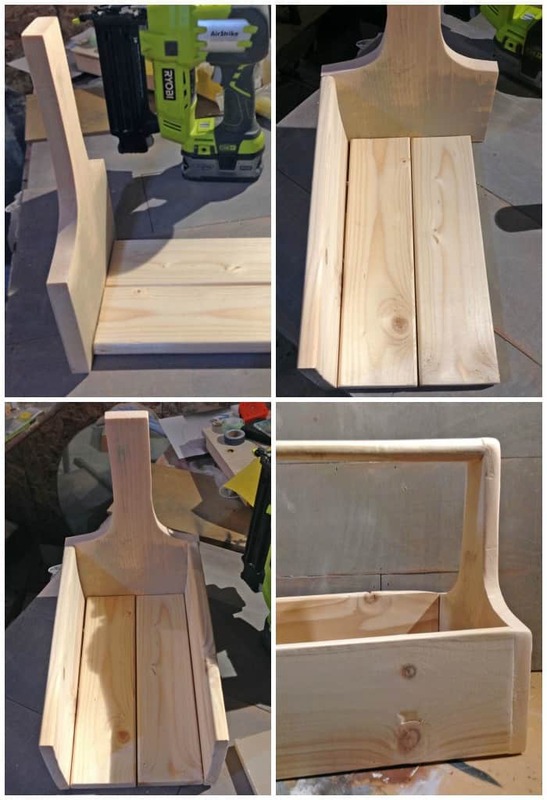 Assembly of this Wood Caddy is quite easy. Using wood glue on the seams, nail the bottom boards to one end. Add one side at a time, and finish with the opposite end pattern piece. Slide 1×2 in between the opposing ends and nail or screw in place to make the handle, easy peasy! Now you can sand and paint or stain your desired color! Can you believe how easy it was to make. 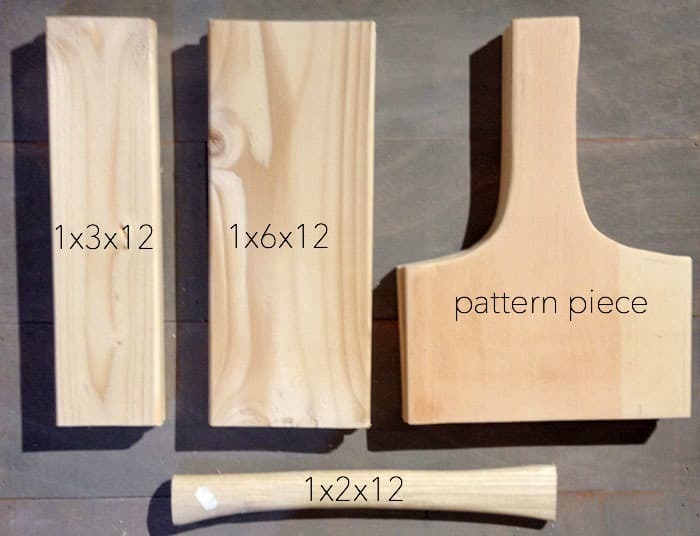 If you have scraps of wood around, you can probably make it for next to nothing! 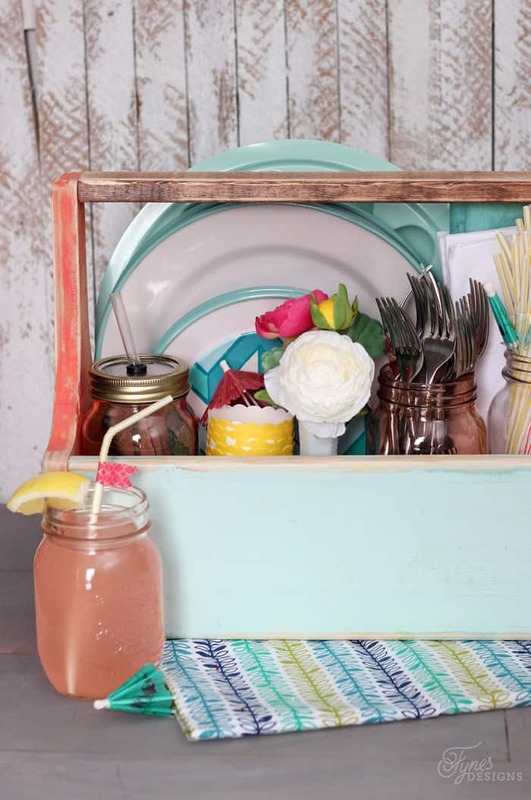 There are so many fun ways to use this wood caddy, I bet you can’t wait to make one! 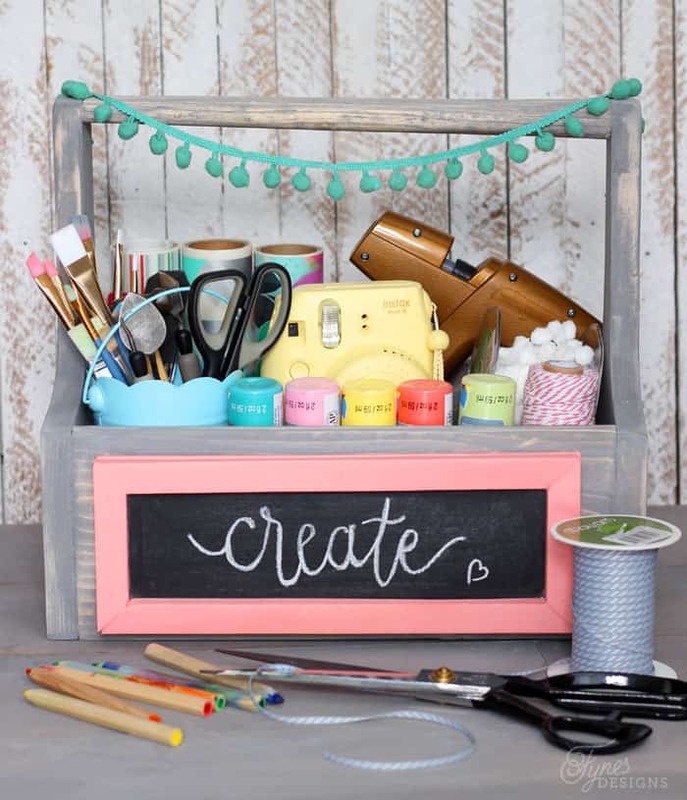 Easily change the appearance of your wood crate by adding a framed chalkboard, a phrase, or a pretty decal to the side to easily change the look. Wouldn’t this be perfect for the picnic table camping, or next to the BBQ? Or stuff it full of craft supplies, for you or the kiddos! I think I might put one on the counter for things that need to go back to the craft room! 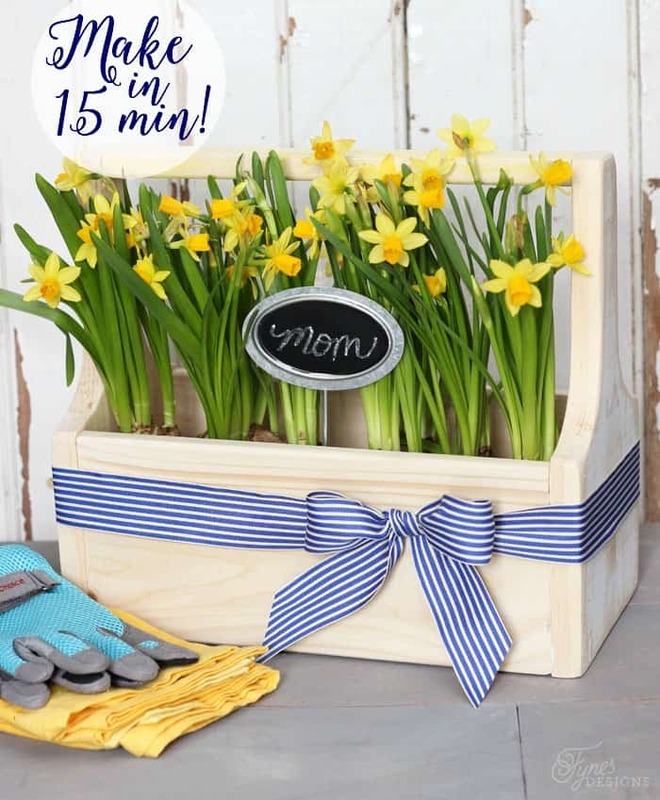 Or how about a beautiful gardening box for Mom. Add a May Arts Ribbon bow and it makes a perfect Mother’s day gift! I also used one in my new laundry room, filled with Mason jars and hand towels. There are just so many ways to use this little DIY wood caddy. How would you use one? This is so adorable, love it with the daffodils, it looks so gorgeous! And I could see using this on my desk, with a few flowers, pens, scissors, etc. Perfect! So happy you like them Nikki! They are pretty and functional! So pretty and I love all the different designs! Thanks so much for linking up with #ShareTheWealthSunday! Oh this is so lovely. I have really enjoyed gardening this year. Thanks for sharing with Small Victories Sunday linkup. Pinned to our linkup board. Let me know which posts you enjoyed from our linkup and they may get a special feature! This turned out so cute! I love crates like this and the possibilities of decorating it are endless. Thank you so much for linking up at Totally Terrific Tuesday! I am thrilled to have you around! Hi Virginia, pleased to meet you, this is my first time to your blog and thank you for introducing me via Friday Features on my blog, this week. I love your project, I thinkm y fav is the utensils caddy, I would use that for outdoor meals. You have so many ideas, I would love to have you share weekly, Wordless wed and Friday Features. Thanks so much for stopping by Karren, a pleasure to meet you! Very cute! Thanks for sharing at the #HomeMattersParty. Hope to have you party with us again Friday.